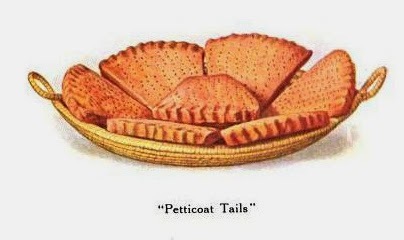 Scottish short bread in some 19th century recipes was baked in a "petticoat" shape. A recipe from 1820 had carraway seeds, a mutchkin of water, butter, lots of flour and less sugar, mixed then rolled thin and pricked on top. The shape was achieved by rolling the dough, cutting into a circle using a dinner plate as a stencil, and an inner circle cut with a tumbler. The ring of shortbread dough was then cut in 8 pieces with a "paste runner." The runner was probably a jigger or pastry crimper. In 1915, a cookbook related the story of the source of the name "... it is commonly believed that Mary, Queen of Scots, brought from France the recipe "petits gateaux tailes," which name soon became corrupted to petticoat tails." I have made the recipe with caraway seeds, which is delicious dunked in tea or coffee. Take two pounds of butter, and a mutchkin (pint) of water to the peck of flour, one pound of sugar, and two ounces of carraway seeds. Mix the flour and seeds together, (keeping out a pound of the flour, to roll them out); then make a hole in the middle of the flour, and pour in the butter and water, when scalding hot. Knead it very little, and divide it into six parts. Flour a sheet of gray paper, and roll out one of the parts very thin and round. Prick it with a dabber. Turn over a flat dinner plate, and cut the bread round by it with a paste runner; then take off the plate, lay on a saucer, and cut it the size of it. Keep the middle circle whole, and divide the other into eight quarters with the runner. Roll out the other parts in a similar manner, and fire them nicely. Rub six ounces of butter into a pound of flour, and six ounces of sugar, add a little water, and work into a smooth dough. Divide into two, roll into round cakes about the size of a dinner plate. Cut a round cake from the centre of each with a cutter four inches in diameter, then divide the outside of each into eight, prickle on the top, dust over with fine ground sugar, and bake in a moderate oven about twenty minutes. Cream the butter and sugar together thoroughly in a basin, add the egg, cream and flour very gradually. Turn out on a floured baking board, knead until smooth, and roll out into a large round. Cut out a small round from the center, then divide the remaining portion into eight pieces. Pinch the edges, mark all over with a fork, and lay on a buttered baking tin. Bake in a moderate oven for fifteen minutes. These small shortbreads of Scotland which go by the name of Petticoat Tails have a connection with a royal personage, for it is commonly believed that Mary, Queen of Scots, brought from France the recipe "petits gateaux tailes," which name soon became corrupted to petticoat tails.